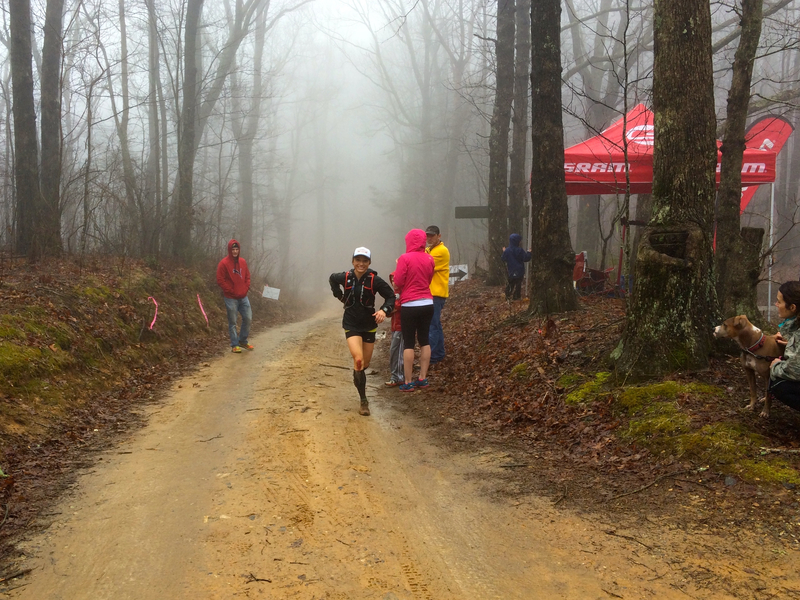 Georgia Death Race (GDR) 68-Mile trail run was the kickoff event for the 2015 US Skyrunning Series Ultra discipline races. As the longest run in the series, GDR also boasts the most total gain (20,000’) of any of the races, making it a worthy challenge for the Skyrunner reputation. Amicalola State Park Falls in northern Georgia. Photo: Andrew Pattison. The series began in Europe as an extension of the records set by Italian mountaineer Marino Giacometti on Mont Blanc and Monte Rosa in the Italian Alps in the 1990’s. Skyrunning developed into a series of international running events located in the world’s most iconic mountain ranges. Skyrunning is now governed by the International Skyrunning Federation. ISF also oversees the Skyrunning World Series, which includes The Rut 50K in Big Sky, Montana. 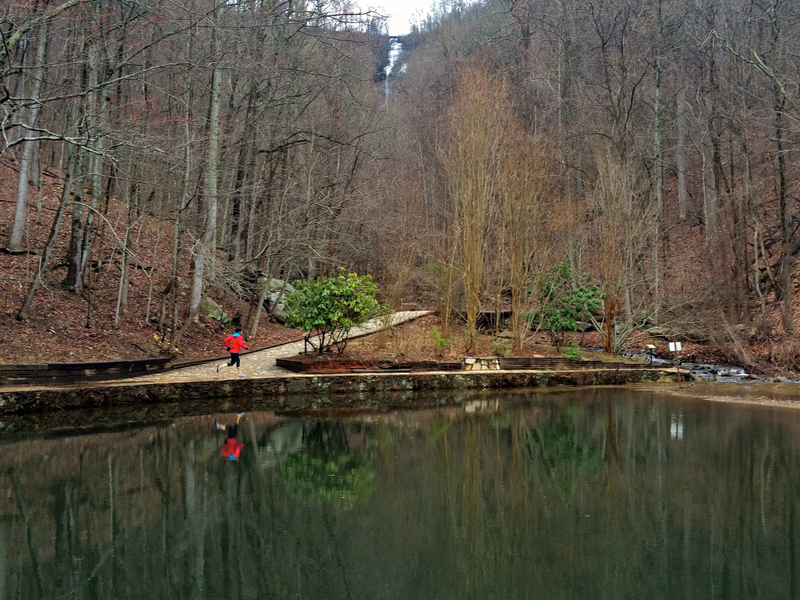 In the inaugural 2014 GDR season, Race Director Sean “Run Bum” Blanton, took runners on a scenic, point-to-point tour of the southern Appalachian Mountain region in northern Georgia. 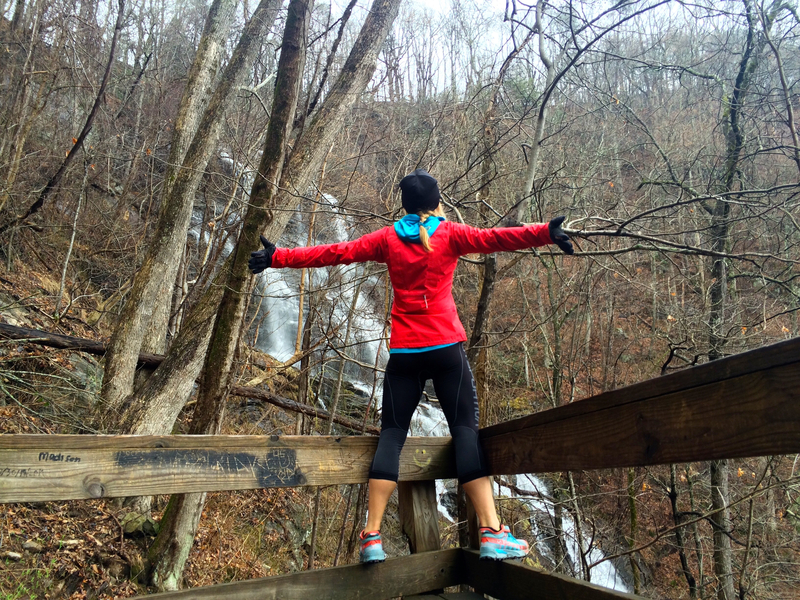 The original course began at Vogel State Park, climbing steeply up to the Duncan Ridge National Scenic Trail, following the undulations of the ridge, and finishing in Amicalola Falls State Park—the southernmost end of the historic Appalachian Trail. 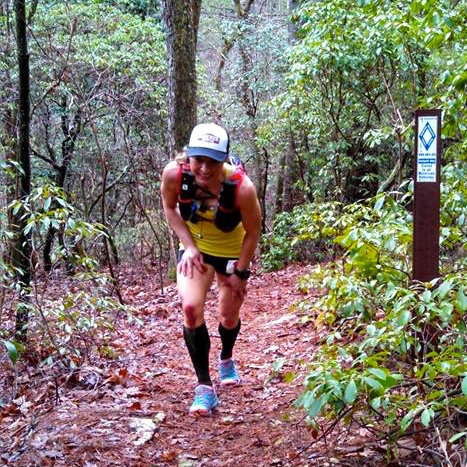 Running in the mountains of the south offers different challenges than races in the Rocky Mountains of Colorado and Montana, or the Sierra Nevada mountains of California. At much lower elevations (GDR ranges from 1500’-4200’), races in the South are less likely to cause acute altitude illness or include exposed 2000-foot climbs above tree line. However, at lower elevations, temperatures and relative humidities can be much higher even in the shoulder seasons. Daytime highs in March for the areas surrounding GDR are predicted to be at least 65-degrees with nearly 100% RH. 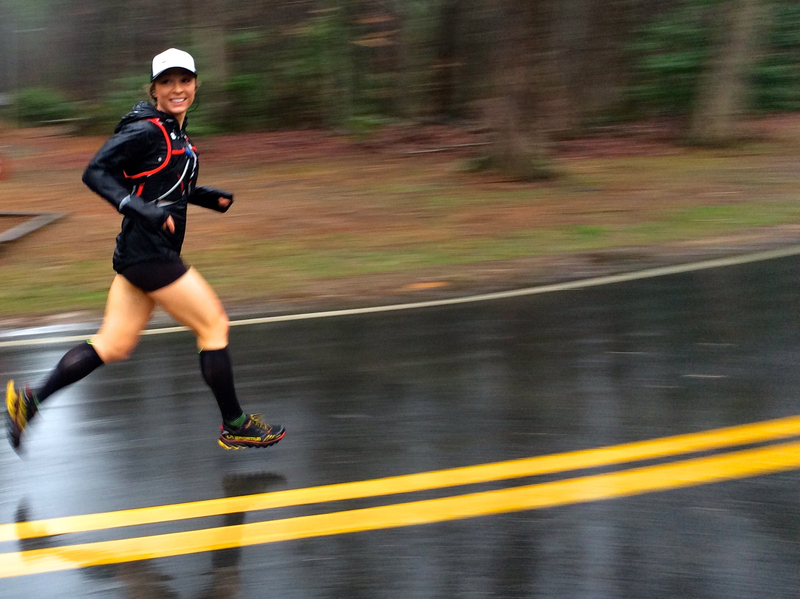 Unpredictable conditions in these seasons, including heavy snowfall or rains make planning for race day tricky. Four days prior to the event, the entire course had to be rerouted. US Forest Service policy in the Blue Ridge Ranger District (at the race start near Vogel) calls for a “rain route” for events to be rerouted off trails in rainy conditions. Although the reasoning for this clause was unclear—safety for runners, lobbying by hiking groups, potential damage to trails were all cited reasons—Sean and his volunteers were forced to use a compromised route, reversing the entire race course. Additionally, portions of single track trail were excluded, and runners would start on nearly 30-miles of dirt and gravel roads. Race participants would be reaching the most difficult stretches of the Duncan Ridge Trail later in the day, under more fatigue, and likely in the dark. Clearly, Sean is passionate about this race. After months of Facebook posts to runners, declaring “YOU’RE GONNA DIE!” he wasn’t about to back down and lose the opportunity to give his racers the tough challenge they expected. Scrambling, Sean and his crew miraculously pulled the event back together, re-printed race shirts, and made the details work out the best they could. Maps for the original route didn’t show up on Sean’s announcements until the week before the race, but after the course change, there were only written instructions supplied for the new course. Race morning forecasts called for a steady rain most of the day. Packs loaded with all of our “mandatory” race gear—headlamp, space blanket, whistle, thermal top, etc.—we charged out of Amicalola on our way to Vogel in the misty, humid forests of North Georgia. Temperatures were mild most of the day, which made for a happy tradeoff for the constant rain. Along the course, there were 3 crewed locations at mile 24-ish, mile 44-ish, mile 55-ish. (All distances on the course were estimated. Sean reiterated regularly that all distances sited on course were “-ish” as he had no time to GPS the actual route.) I planned to rely only on my husband Drew for supplies at the 3 crew stations and to follow flagging until the finish line. On my way to the first crew-point, two of the trailing women passed as I headed into the woods for a pit-stop. Catching them soon after on a climb was the last time I saw or heard much about them until the finish line. Running in the lead is never easy business because you never know exactly how fast or far behind your counterparts are running. My plan to run conservatively for at least the first 55K was almost shattered when I saw those ladies were so close behind. Prior to the race though, I knew this would be the case, as my strength lies in steep and technical mountain running. At mile 44 a volunteer told me I was “way ahead,” while my husband told me I was still only 5-minutes in the lead. But, I was hopeful as the most difficult sections were later in the race. An estimated 10,000’ of gain was still to be had in the last marathon, where I could potentially gain ground. Finally, we were moving onto the most difficult and mountainous single track. For the next 11-miles the course stayed nearly on a ridge, making for hard pulls upwards, awkward side hills, and downhill pushes on rocky paths covered in slimy mud and leaves. Some portions of the trail were completely indecipherable, saved by a few disheveled leaves from earlier runners. The ridge line was shrouded in fog, so none of the surrounding views were available, but my focus was on forward progress. I remember few details from the day besides occasional human sightings at aid stations where I waved, called out my number, and skirted through. At the final crew point around mile 54, I was fairly aware of my lead, but only after the race ended did I learn I’d put a 24-minute gap on the next woman. Another racer left with me and tagged along for a bit. “You’re in the top 10 overall!” he announced cheerfully. Soon after, I let him go, but was glad for the brief company. My mind was going sour. Maybe from the monotonous hours of unrelenting gray fog and brown leaves. Mostly though, I was in pain. And my body was rejecting this 68-mile proposal so early in the season. Throughout the day, despite my improved running fitness—thanks be to my coach Ellie G.—it was clear this race wouldn’t be memorable except as a rough learning experience. The final 13-miles were the slowest half-marathon since my last 100-mile race. When I left the last crew location I figured I may be able to finish the race just over 12-hours. Soon, it was clear I’d be using my headlamp. Stubbornly, I didn’t put it on until the last signs of dusk were disappearing on the horizon. Picking my way off Duncan ridge in the fog, headlamp beam clouded in misting rain, I approached the finish line carefully, not wanting to botch the job on a slide down slippery rocks in the dark. So much, I thought, for being stronger on technical terrain. Driven by the idea that the next lady was on my heels, I kept trucking as much as I could on more runnable sections. Deep into the dark of night, at last I was creeping up on the last 5k and I was sincerely ready to put the day to bed. Before long though, the dirt road I’d been following suddenly ended at black tarmac. A couple of sad pieces of flagging lay in the mud on the left side of the dirt pullout where I marched around searching for another clue whilst cars rushed by at 45. A sign with an arrow laid on the ground muddy and kicked over. To the right was another dirt road going downhill away from the paved road. The wide, 2-lane highway headed uphill to the right where I could see several cars coming down, and it headed down to the left toward what looked like the park and finish line, with subdued orange lights. The dirt road looked misleading and uphill made no sense. While I ran in all of these directions shortly looking for flagging in my headlamp beam, cars kept rushing by on the wet highway heading downhill. This all went on for approximately 2-min by my GPS data and ended with the gentleman telling me Vogel was down the road. Out of the 4 options, this was the most sensible to me so I ran down the road trying not to panic (for approximately 11-min). It’s easy to negotiate with yourself that you missed seeing one flag with the rushing cars, blinding headlights in the dark, and steep shoulders, but two? I urgently flagged down the next vehicle. Fortuitously, this one was a race volunteer who showed me I was nearly to the finish line. On the wrong route. I cursed a lot. I almost started crying. By the time I was back up to the highway crossing, I was frantic. I found the small trail heading down into the wooded abyss on the other side of the highway (you could see flagging about 100-feet downhill in a headlamp beam once you were on the opposite side of the road). Running angrily downhill through every bit of pain, I was nearly hyperventilating. Crossing the finish line, I was so relieved to give Sean a high-five I almost forgot to chew him out for the road crossing. Almost. The finish line gathering grew uncomfortably quiet. I saw some sideways glances. And that’s when I turned and saw for myself: Kandy Ferris had already won the race. I’d lost nearly 24-minutes in my foray off course. Kandy ran a solid race and won by just over 3-minutes. Speaking of losing it…I walked away. That was all I could manage. And that was the last walking I could manage for awhile. Three of the guys who came in before me had lost their way at the same place. Clay Warner lost fifth place and came in sixth for the same reason. Soon after I got lost though, a volunteer was sent up to re-flag the road crossing. Unfortunately for me in this case, keeping your cool and thinking clearly in the latter reaches of a race are all part of the game. If you don’t, “you fucked up.” And, you probably lost. I struggle with trying to be sincere writing race reports, while trying not to reveal too much of the true suffering that ensues on these long runs. I don’t want to dissuade my friends from trying longer distances after emphatically telling them it’s wonderful like sunshine and bunnies. But I erred on the side of transparency here so someone, somewhere may learn from my mistakes and come out the other side wiser and more ready. Take what you want. Link to the iRun Far This Week in Running: March 16, 2015 with some insights into this scenario by Sean Blanton and Ian Sharman under the Comments section. Link to the US Skyrunning Ultra Series Standings for 2015. Link to the full official UltraSignup Results for Georgia Death Race 2015. Seans races are poorly marked. He seems to take great delight in this fact …. I disagree. There are times when there are confusing spots, but nothing too radical. It has never come across as unintentional, just overlooked maybe. I’ve been in much worse races. I also am more laid back and not trying to compete, so I understand the frustration when you are trying to win and get lost. I ran Grayson Highlands this year and it was marked just fine. I had no trouble at all staying on course. This was run during the daylight hours, though, when flagging was easier to see.